The Aztecs practiced human sacrifice on a scale which revolted the soldiers of Imperial Spain, a culture which in other respects was very similar to that of the Aztecs, as Cortes remarked in his letters to King Charles (Cortes, 1962). In this essay I will explore a variety of theories which seek to explain the extreme human sacrifice practice of the Aztecs, especially at Tenochtitlan, in terms of religion, catastrophe, nutrition, and, in greater detail, economics. Even had the Spaniards not virtually obliterated indigenous written history in the area, it still might not be possible to understand the reasons for the massive scale of human sacrifice at Tenochtitlan, since the practice was rationalized, consciously or unconsciously, by religion. It seems to be a clear rational for human sacrifice. Huitzilopochtli is a particularly thirsty war god and the primary god of the Aztecs. Quetzalcoatl, on the other hand, was opposed to human sacrifice. While writing primarily from a materialist perspective, I do not wish to suggest that religion (spiritually or psychologically interpreted) plays no motivational role in human behavior. The emphasis on the role of a 'higher power' in 12 step programs for every major addiction is sufficient evidence to the contrary. And interpreting the past based on material culture does not necessarily mean that the interpretation must a priori be materialistic if the evidence suggests otherwise. For example, while there can be a clear argument made for political advantage accruing to the successor of a diseased King who builds a conspicuously impressive burial monument to his memory (Hayden, 1993: pg. 286), a materialist interpretation is not as clear cut when the bodies of non-noble sacrifice victims are disposed of with care and attention in the absence of any central figure of importance, seemingly for their own sake, as was the case in the Late Preclassic burial mound excavation at Chalchuapa, El Salvador (Fowler, 1984). Fowler suggests that the remains may be of war captives, but they were accorded more dignity in burial than was shown Aztec victims. Grave goods were few, but the bodies of 13 of 33 were coated with red hematite, and 24 of the burials were covered with bark cloth. While "chiefs and their supporters" could collude "to use the power of the sacrifice to demonstrate their own achievement of power" (Hayden, 1993), I would suggest that ceremonial burial and the cost in time/energy it entails reflects a religious dimension absent in the disposal of the bodies of Aztec victims. Throwing the body down the stairs and chopping off the arms and legs for possible later consumption and throwing the trunk to the animals in the zoo (Harner, 1977) seems a most unceremonious ceremonial. Further, the consumption of human flesh was a prerogative of the gods. By sharing in it, especially costumed as gods, the nobles served the very secular interest of enhancing their 'godlike' image and authority. "The commoners, by contrast, did not dress like the gods or share in cannibalistic meals" (from Duran, in Ingham, 1984). As well, religious motivation is inadequate to explain the degree to which human sacrifice was practiced. Quetzalcoatl didn't think it was necessary at all. Religious necessity can be served symbolically, or else a single human sacrifice can be imbued with very great significance, as in the case of Roman Catholicism. Even one sacrifice to the bloodiest goddess in the Hindu pantheon, Kali, would keep the goddess happy for a thousand years (Kalika Purana, in Campbell, 1962; pg. 6). This would not prevent her worshippers from attempting to make her very happy, but even at their most enthusiastic, Kali looked like a tea granny compared to Huitzilopochtli. The Aztec practice went beyond what was required by religious necessity. If human life had been as sacred to them as it was to Quetzalcoatl it would have been a very different religion. The scale of sacrifice displays a strong disregard for life except as a tool to display power in the taking of it. Next door to a face value acceptance of religious motivation is a theory where human sacrifice and associated ritual serves as a form of psychotherapy whose goal is to relieve a population's post traumatic stress after phenomenally huge natural disasters especially floods. For the old world Gunnar Heinsohn (1992) also cites evidence for large scale fire and earthquakes, all possibly the product of a large comet or comet fragments striking the earth during the bronze age. While Heinsohn makes a global claim for the applicability of the theory and for world wide flooding, his focus is on Bronze Age Mesopotamia and the emergence of civilization with its associated priest-kings and human sacrifice. He makes much of a section from the Old Babylonian version of the 'Epic of Etana' wherein there is reference to a "beclouded people" who had "no counseling", so "kingship descended from heaven" (Heinsohn, 1992). Apparently, the blood rituals of these counselors were imitations of actual events which took place during the cataclysm, and witnessing the re-enactment of these events in ritual had a therapeutic effect on the terror stricken community. Regardless of whether one accepts that there was a large scale world wide flood, this theory seems in its characterization of stress reactions to be somewhat counter intuitive. In our own time, natural disaster seems to be an equalizer which brings out the best in people, as neighbours who may not have even spoken to one another help each other get through the hardship. Going way back to the Paleolithic, Brian Hayden (1993) and others (e.g. Winterhalder, 1986, in Hayden, 1993; pgs 154-156) have theorized that tribes were a good deal more altruistic than we, and that general reciprocity was critical to human survival, a "Paleolithic Insurance Corporation" (Hayden 1993; pg. 155). In tough times people pull together. It is abundance which best affords inequality. And cutting each other up. From a simple psychological perspective the whole theory is somewhat flawed. The cathartic effect of tragedy comes from the story and the characters, not from spectacle. Exposing terrified people to an intense representation of the origin of their terror is likely to... well, terrify them. In contemporary phobia therapy the client is gradually taken through various levels from thoughts to the actual, but a phobia is generally defined as an irrational fear. Post traumatic stress is even more difficult to treat. More specifically to our topic, we know that the foreparents of the Aztecs were Uto-Aztecan speakers who came south to escape drought (Hayden, 1996). We also know that catastrophe is featured in Aztec myth, stories of flood and destruction, this world being that of the fifth sun, the four previous not having worked out (Manuscript 1588, in Day, 1992). Yet however well the theory may work in the Old World, it seems very weak in the new. Even if the myths have their origin in actual natural disasters on a grand scale, the actual trauma had long past. In this case, the mythic accounts might better be regarded as ancient artifacts put to new use in legitimizing the techniques of intimidation employed by the nobles to encourage payment of tribute and thereby enhance their own power. As will be discussed shortly, the people of Tenochtitlan were dependent upon tribute for survival. Nobles were in charge of redistribution, from whence great power is derived (Hayden, 1993; pg. 268. Ingham, 1984). This seems more parsimonious than a psychological rationalization of a religious practice. Given the scale of Aztec sacrifice, it would be surprising if no one suggested that they were using people as a domesticated animal source of protein. There are many references in the Spanish sources to cannibalism, the estimates of number sacrificed annually ranging from Cortes' three to four thousand annually (Cortes, 1962; pg. 24) to 20,000, to 80,400 in several sources (Tezozomoc, Ixtlilxochitl, and Duran (in Cook, 1946, in Harner, 1977), to a contemporary estimate of 250,000 (Borah, in Harner, 1977). I haven't found archaeological sources which back up these estimates. There is an account of one skull rack which had 100 skulls associated (Harner, 1977), a far cry from the 136,000 estimated by Andres de Tapia (1963, in Harner, 1977) at Tenochtitlan, or the "more than 100,000" estimated by Diaz (1963, in Harner, 1977) at Xocotlan. Fortunately, we are not totally dependent on historical sources. That human sacrifice was a major part of Aztec culture is testified to by the many stone receptacles for hearts and depictions of human sacrifice in Aztec art. We can know with certitude, if not exactitude. Yet even if we knew the exact numbers sacrificed annually, we still would not know for certain how many pounds of flesh were actually consumed. If all flesh of all victims was eaten, would it constitute a good dietary source of protein? This is the position taken by Michael Harner (1977). Since cannibalism is everywhere reviled, except when sanctioned by religion or possibly urgent need (both typically small scale), Harner argues that it was critical to the Aztec diet. Were it not for glaring factual errors, failure to consider all potential sources of food, and a disregard for conventional responses to resource stress, it would be a compelling theory. Harner (1977) argues that the Aztecs had no domestic animals and that, aside from protein rich pond scum cakes, insects, and reptiles (all considered of little importance by Harner), their only conventional sources of protein were beans and maize. He states that these would have to have been eaten together, or individually in massive quantities in order to meet the body's need for eight essential amino acids. Any kind of resource stress, such as the drought of 1450 would have been totally disastrous. The Aztec answer to this precarious situation was large scale cannibalism. Unfortunately, given the figures for population, percent of population belonging to the nobility, and number sacrificed which Harner gives "for the sake of discussion" (all very soft), human flesh might have been very marginally adequate in Tenochtitlan, and not at all anywhere else in the Aztec empire (de Montellano, 1978). Bernard R. Oritz de Montellano cites two possible diets created by Oliveira and Carvalho (1975, in de Montellano, 1978) consisting of corn, beans, chia, and huauhtli, all foods the Aztecs received in tribute, which would have been nutritionally adequate. In fact, de Montellano notes that this diet would be superior to that of the average Mexican today. Based on estimates of the yield of chinapas agriculture (enough to feed 180,000), and tribute (60,000 to 150,000), Tenochtitlan would have had enough to feed its population (estimated at 300,000) (de Montellano, 1978). And this is considering only the two main sources. In addition to these, other sources consumed by the Aztecs include tropical fruits and vegetables, water fowl, armadillo, gopher, weasels, rattle snakes, mice, iguanas, deer, turkeys, dogs, fish, frogs, salamanders, fish eggs, water flies, corixid water beetles, grasshoppers, ants, and worms (de Montellano, 1978). Apparently they did not have the same aversion to eating many types of creature that the Europeans and their descendants have. I forget which is 'R' and which is 'K', but basically the little guys that reproduce quickly have collectively a great biomass, and providing the technology exists for exploitation of this resource, can provide a great deal of energy. Finally, de Montellano looked for conventional responses to resource stress, specifically the famine of 1450. Chinampa agriculture was expanded by the construction of hydraulic works to "separate and contain the salt- and freshwater lagoons (Palerm and Worlf, 1972, in de Montellano, 1978). They also expanded military conquests: "An analysis of the list of conquered towns in the Codex Mendoza reveals that towns were conquered at a rate of 1.39 per year during the reigns of Itzcoatl and Motecuhzoma I (Moctezuma I),which occurred before and immediately after the famine, and at the rate of 2.6 per year under subsequent rulers until the arrival of the Spanish." (de Montellano, 1978). Both of these strategies, technological and military, are present and much more likely than resorting to human flesh on a large scale for sustenance. While no doubt nobles practicing ritual cannibalism did aquire some essential amino acids, their primary motivation was not nutrition. For all its flaws, the nutrition through cannibalism theory is at least looking in the right direction. Tenochtitlan was not self sufficient. Its population could not be supported by even the most copious yields of its technologically advanced intensive agriculture. Tribute from neighbouring states was required to make up the difference. The paying of tribute from one state to another is a practice known world wide throughout history. Tribute type transactions between Cortes and the indigenous people of Mesoamerica were transparent to both sides, unremarkable, given. These typically took the form of the locals giving Cortes some treasure, and often agreeing to adopt his god and be loyal to his Emperor (Cortes, 1962; pgs 10, 11, 14, 16, 49, 67, stopped counting...) which the Spanish seemed to take at face value, failing to understand that the relationship was only good for as long as they were perceived as being able to enforce it. When the Indians reverted to prior practices, they were thought of as dishonest (Diaz, 1963; in Harner, 1977). It could be argued that they were more honest in their understanding of foreign affairs than the Spaniards, who seemed to expect them to behave in a manner which they themselves would not were their positions reversed. Moreover, from that time forth they gave and offered themselves as vassals to your Majesty which they would ever be, serving your Majesty and giving as tribute whatsoever he might command. This was exactly the approach of the Aztecs to territories they wanted tribute from. Both the Aztecs and the Spanish liked to make offers you couldn't refuse. Perhaps the greatest difference between them, however, was human sacrifice. While the Spaniards were familiar with the virtue of dying in the service of God, King, and Country, and more generally with the virtue of service to these entities, they did not see clearly how human sacrifice could be rationalized as being in terms of these virtues. They were not conditioned to it from birth as the Aztecs were. They came upon it from the outside and it must have seemed diabolically incomprehensible. Yet for God, King, and Country was the pretext for not only human sacrifice, but all forms of tribute due the state. The strongest motivator was economic. The religion walked in perfect step with that. The hunger of the gods was the hunger of Tenochtitlan. When the gods were well fed, so was Tenochtitlan. The chief god of the Aztecs, Huitzilopochtli, was the god of war for a militaristic people. He was very hungry. The prime food of Huitzilopochtli was not, however, the prime food of the people. The consumption of human flesh, Huitzilopochtli's leftovers (Harner, 1977), functionally established the nobles as divinely privileged and empowered. Only warriors were exempt from paying tribute, a further incentive for belonging to that class. Everyone else, Aztec citizen and citizen of the subject state, paid with either goods, services, or their lives - the latter honour serving as a disincentive to refusing to pay. The 'option' of not being sacrificed had very great appeal. A neighbouring state from which Aztec's wanted tribute could pay in goods or services, or it could pay with the hearts of its warriors first, then pay with its goods and services (Ingham, 1984). The Aztec Emperors made a point of inviting foreign dignitaries from other states to Tenochtitlan to witness the mass sacrifices which occurred at certain festivals, most particularly the solar ones (Ingham, 1984). The captives being slain may have been captured from the dignitary's own territory (Kurtz, 1978). 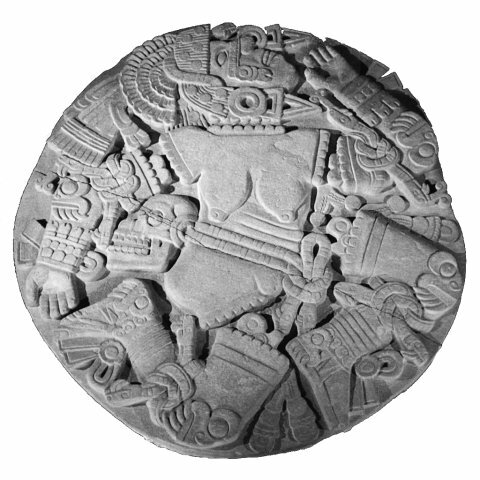 The purely secular lesson found its religious expression in the round flat Coyolxauhqui stone at the foot of the stairs of Templo Mayor down which the bodies rolled. This object is a disk approximately 89 x 79.5 x 15 inches upon which is portrayed the goddess Coyolxauhqui. Her head, arms and legs are unattached, with bones protruding from her limbs. made of them his own insignia. To oppose the Aztecs would have been to oppose Huitzilopochtli, and the lesson of what happens to those who oppose Huitzilopochtli would not have been lost on the visiting nobles watching their sacrificed warriors land on that stone. One way or another, tribute had to be paid. Vassal states would be incorporated into the Aztec destiny. The strategy of state intimidation and extortion exists in a milder form today in the modern state in the institution of compulsory taxation. Debtors' prison has been abolished for everything except debts to the state unvolitionally incurred by virtue of earning a living! However, the state has the right to dispose of its citizens lives only in times of war or for the crime of murder. Furthermore, the modern state coerces quietly. It does not seek to inspire terror. Even Nazi Germany sought to secure its citizens compliance through propaganda painting a rosy future for the master race, and reserved terror methods for the enemy, as did the allies (Dresden, 1945). Constant overt state terrorism coupled with large scale extortion makes very bitter enemies, even in a region where tribute paying and warfare are common. When Aztec demands for tribute were greatest, there is evidence that reconquest was necessary for states that had had enough. Worse, when the Spaniards arrived they found ready allies who hated the Aztecs passionately. Even when Cortes returned from Tenochtitlan with his troops in very sad condition, the Tlascans did not take advantage of their weakness to defeat them (Cortes, 1962; pg. 124-125). Their hatred of the Aztecs made them very trustworthy allies. The Aztec Emperor Muteczuma declared a tribute free year for all who would join to fight the Spanish, but it was too late (Cortes, 1962; pg. 132). "Moctezuma and the Mexicans have oppressed us much, they have overwhelmed us. We are up to our noses in the anguish and affliction they have given us. He demands everything from us in tribute.... [T]he Mexican is an inhuman being. He is very perverse.... The Mexicans are extremely bad. There is nobody who can surpass the Mexican in evil." If I'm to argue that the prime motive for the practice of human sacrifice and general inspiration of coercive terror was economic, then there are two questions which need to be answered. Why was a religious context necessary for inspiration of terror? Why even go to such an extreme to ensure compliance? Especially since it is so counter productive in the long run. It may be that the answers can be found in the history of the Aztecs. This is too involved to go into in great detail in a paper of this length, but in brief, their foreparents came from the north scorched by drought. At that time they had little power or influence. When they acquired a reputation for wife stealing, they were persecuted and a portion of the population moved to a more defensive position on the island of Tlatiloco. The ones on the mainland served as mercenaries, making a living through war. Much later, Tlacaelel encouraged warriors to consider the battlefield as a "marketplace" (Duran, in Ingham, 1984), and this view may be found even at the foundation of the Aztec state. For sacrificing the princess of a powerful neighbouring tribe they were once again set upon, this time fleeing to Tenochtitlan (Hayden, 1996). From the very beginning the Aztecs were a warrior people. Their primary god was a god of war. Their rise from obscurity was through war. They didn't seem to suffer long from set backs, and their tremendous successes must have been very reinforcing. To return to the first question, that of religious context, I don't believe that religions are invented by scheming gang leaders or politicians. Rather, they evolve quite organically to reflect the world view of a people. It can be argued that our science is a religion, our theories stories that explain how things are. The religion of the Aztecs can be viewed as a natural product of their own rather bloody history. This is not to say that religion is in any way pure. Once extant it can and is used by those in power to motivate people to conform to their wishes by demonstrating their closeness to the gods and making their own interests appears as the gods'. Force alone is inefficient. "The stability and continuity of the regime are made possible through a complex system of symbolism that gives it legitimacy by representing it ultimately as a 'natural' part of the celestial order" (Cohen, 1969). However, the origin of the religion precedes its manipulation, and through manipulation it evolves. As for the second question, the extent of the terror, it is curious that the Aztecs did not adopt a more stable form of control such as that practiced by the Romans, a likewise militaristic empire which enjoyed tribute from all over Europe and parts of Africa. Part of the key to their success was the rule of governors acting as overseers of Roman interests while the population could carry on according to local customs so long as they acknowledged the Emperor and paid their taxes. Essentially, the Romans maintained a presence in conquered territories and saw to the details of Empire whilst not annoying the locals excessively by disturbing their lives. Indeed, they may even have improved it in some ways, as humorously alluded to in the Monty Python film The Life of Brian. In response to a zealot's question "What have the Romans ever done for us? ", the answers that flood back all have to do with law, order, and improved quality of life. Harner (1977) suggests that the Aztecs deliberately kept their empire in an inchoate state, since it wouldn't be right to eat people too much associated with themselves. De Montellano (1978) rejects this "dining out" theory, and Hardoy (1973, in Kurtz, 1978) argues that there were just too many little states to ride herd on, a physical impossibility, so instead the Aztecs used a policy of terror to keep them all in line. Another possibility is that the Aztecs history of hardship and warfare (as opposed to the Roman's early history of republican government) made them well aware of the utility of terror. They then extended this to the management of empire. It was what they knew and did best, and it was very successful until the coming of Cortes, who found the road to Tenochtitlan with hatred paved, and waiting for such a one as him. Analysis is artificial, rather like organs in an anatomy chart appearing in unlikely colours for the sake of clarity. If successful, however, it may be hoped that the function of critical supporting members in an overall structure can be discerned. It is also culturally biased. The experience of religion cannot be captured in this type of analysis, and if an Aztec read this paper he would likely be offended by this secular explanation of terror in the service of the economy, and view it as a gross misrepresentation. However, from the perspective of the religion in which I am writing, that of science (albeit social), the explanation from an economic perspective seems much more powerful than from that of the simply interpreted indigenous religion, catastrophe, or nutrition. Braun, Barbara. 1984. The Aztecs: Art and Sacrifice. Art in America. April, 1984. Graulich, Michel. 1988. Double immolations in ancient Mexican sacrificial ritual. 1993. Archaeology: The Science of Once and Future Things.